We have a long history of discussing ways for ripping the commercial DVDs that you own—from our DVD Ripping FAQ to Jon Seff’s Convert Video For Any Device to Beyond Handbrake’s Defaults. And we do because ripping protected DVDs is a sometimes arcane and shifting science. But if you’ve been a multimedia Mac maven for some time, it’s likely you also have a collection of DVD video projects you’ve burned with iDVD or another disc-burning application. It’s only slightly less likely that you’d like to extract some content from those DVDs for use elsewhere—re-encoding clips to put on your Web site or e-mail to friends and relatives or taking those clips and incorporating them into a new project. Here are some suggestions for doing just that. Open a video DVD on your Mac and inside you’ll find two folders—Video_TS and Audio_TS. (The TS stands for “title set.”) The Video_TS folder contains all the assets necessary to play the movie. Audio_TS folders were designed for audio DVDs. These Audio_TS folders are almost always empty but are included because some older DVD players need to see this folder in order to recognize the DVD as a valid video disc. When working with video extracted from a DVD, you don’t need the Audio_TS folder. Inside the Video_TS folder are files that end with IFO, BUP, and VOB extensions. IFO (Information) files are files that provide navigation information to the player so it knows where chapter, audio, and subtitle data exists. BUP (Backup) files are backups of the IFO files. VOB (Video Objects) files contain the audio, video, and subtitle media. The gold lies in these VOB files. You can easily extract the movie data from an unprotected DVD by dragging the Video_TS folder to your Mac’s Desktop. Once you’ve made the copy you can watch the movie within it by launching Apple’s DVD Player, choosing File -> Open DVD Media, and navigating to the Video_TS folder. It will play on your Mac just as if it was the original DVD. With the right tool you can also play the individual VOB files. That tool is the free, open-source VideoLAN Client (VLC). Just drag and drop a VOB file on top of the VLC application or use VLC’s Open command and navigate to the VOB file you want to watch. VLC is a fine way to watch VOB files, but you can’t do anything with them other than watch. VLC can’t convert these files. Note that you don’t need to haul the Video_TS folder from the DVD in order to muck with its VOB files. You will, however, find these files more responsive if they’re on your Mac’s hard drive rather than accessed from the slower media drive. Squared 5’s free MPEG Streamclip can convert VOB files. It supports a wide variety of output formats including QuickTime, DV, AVI, MPEG, and MPEG-4. It can also extract just the audio tracks from VOB files. 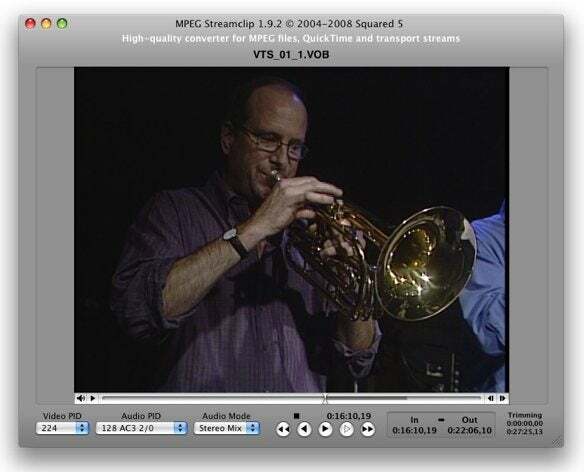 One of MPEG Streamclip’s key advantages is that it can extract precisely the portions of the VOB file that you want. For example, if a VOB file contains the entirety of your family’s recent vacation at water polo camp, you can extract just the underwater portion of the video that highlights Junior’s very personal foul. To do that, open the VOB file with MPEG Streamclip, drag the playhead to where you’d like the extracted clip to begin, choose Edit -> Select In, drag the playhead to where you want the clip to end, and choose Edit -> Select Out. This method obviously saves you time. The conversion process takes less time than converting the entire VOB file and you avoid having to later cut down a converted clip in QuickTime Player Pro or iMovie. When you’ve selected the video you desire, move to the File menu and choose the Export option you want. If you’re planning to place this clip into a new iDVD project, choose File -> Convert to MPEG with MP2 Audio. This will retain the original clip’s quality. If you choose a lossy compressor (MPEG-4, for example) you’ll lose some quality. Everyone’s favorite free open-source DVD ripper, HandBrake, can also extract video from unprotected DVDs as well as from Video_TS folders and individual VOB files. If you were prescient enough to implant chapter markers in your video project when you first created it, HandBrake can extract specific chapters or groups of chapters. On the commercial side of things, Roxio’s $40 Crunch and $100 Toast Titanium 10 can also convert Video_TS folders, though you can’t extract scenes from them. There are other commercial utilities that claim to do this as well. Just Google “Mac convert DVD” and you’ll see a slew of utilities that claim to convert DVDs—both those with protection and without. For the most part, these are the same flawed tool sold under different names and advertised via spam. Avoid them. Now that you’ve converted the DVD video into a usable form, you can do what you like with it. Plunk it into a new iDVD project. Pull it into iMovie and, from there, create e-mail, Web, YouTube, iPod, iPhone, and Apple TV-compatible versions of it and share it with the world. After all, it’s your video.